Here is the second of the background-inspired donation quilts. It’s really just a framed square, but colored like a cabin. This worked up a lot faster than the one from strings (although it didn’t help with my string problem! ), and there was no trimming on the 54 blocks. I’ve sewn the blocks in pairs, and I’ll probably get the whole top finished when I go back up to my lonely studio. No fabric was purchased this week, and I used 4.75 yards to make the Pink Log Cabin quilt. (Thank you for all the positive comments!) So I’m in the black! 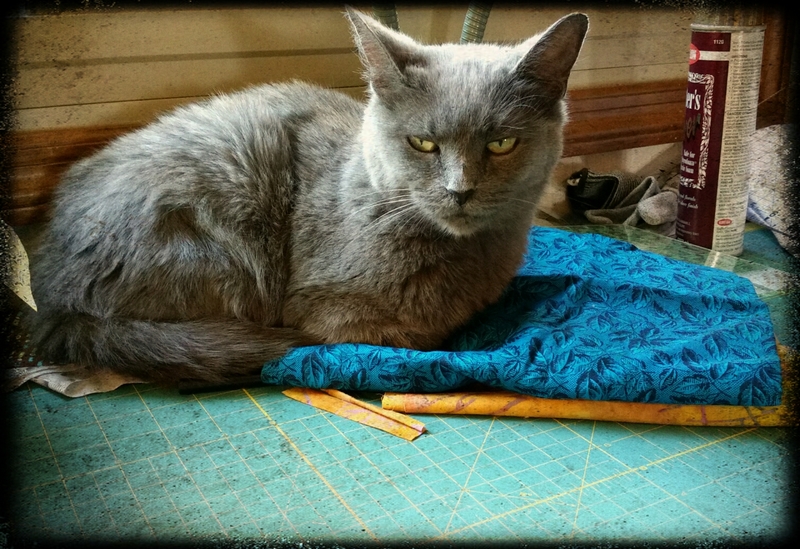 Unfortunately, I have to let you know that my chief quilt helper Krissi passed away suddenly and unexpectedly last night. She was about thirteen, and we had her about ten years. She spent the afternoon in the studio with me, like always, and didn’t seem to suffer at all when she passed later. I don’t have any cute photos of Krissi because she distrusted the camera (unlike Yuri, the ham!). She was beautiful and sweet, with very tall ears, and she loved quilts. I see one block out of place, do you? See any others? These are 7.5″ blocks, and I don’t have a 7.5″ ruler. 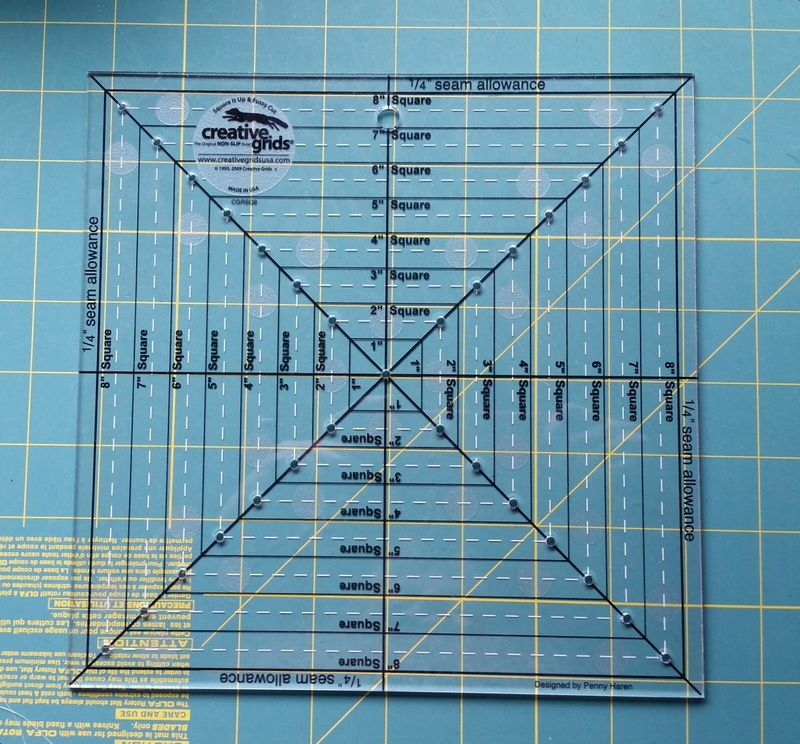 I do have this nifty Creative Grids Squaring Up and Fussy Cutting Ruler. I went online to see how to use it, and also found out that I have the prehistoric version. The new ones are printed with a bar code to view on your phone and go directly to the YouTube instructions. Huh. 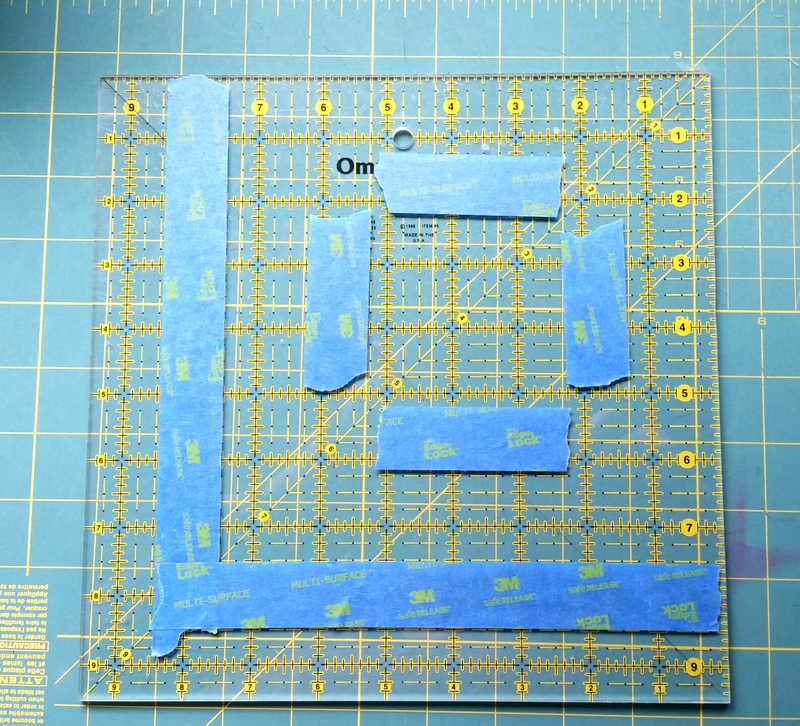 This turned out not to be the tool I wanted for trimming 54 blocks, so I used a little tape on my 9.5″ ruler to make my own, and they trimmed up pretty quickly. Yes! More than a year in the making, I’m very pleased that Scrappy Stars Around the Corner is finished. And I’m pleased with the result. 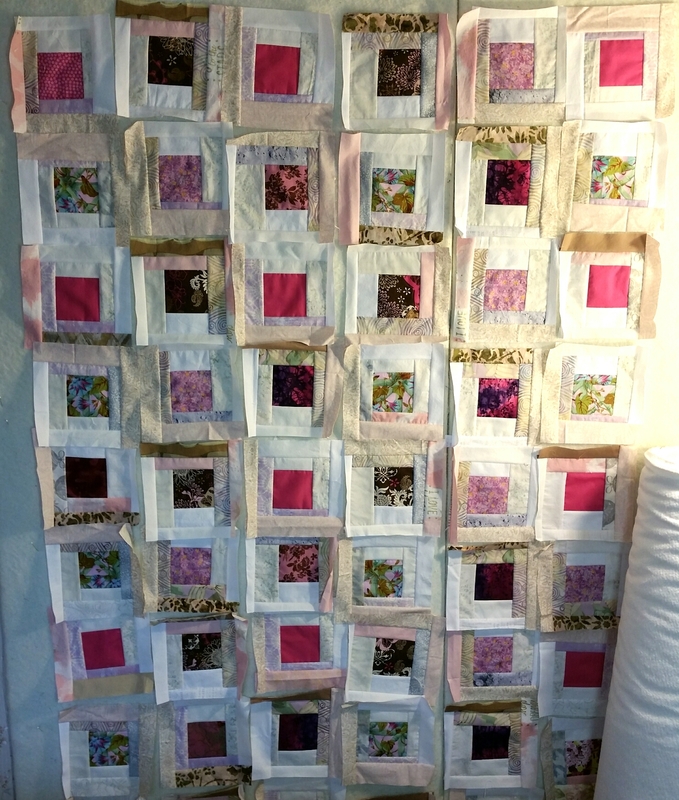 There were moments, as I pushed and pulled the #bigheavyquilt through my machine, when I was afraid that it would be a wonky, stretched-out mess. However, the magic of the washer and dryer put everything back where it should be, and it’s not bad at all. This carton of eggs from my farmers’ market was the inspiration for the color scheme. I knew I would add some darks for contrast, and then I found the turquoise and gray scraps from a project, so it morphed a bit. I originally thought of it for the master bedroom, and giving it borders, but it ended up not matching. Then I let it sit while I tried to decide what to do about it. I finally decided to finish it up for a gift or to donate. The back is pieced from four gray and gold fabrics. This top lay much flatter than Scrap in a Box from the previous year, so perhaps my triangle piecing improved? However, when I went to run quilting lines through it, I discovered problems with my sashing. 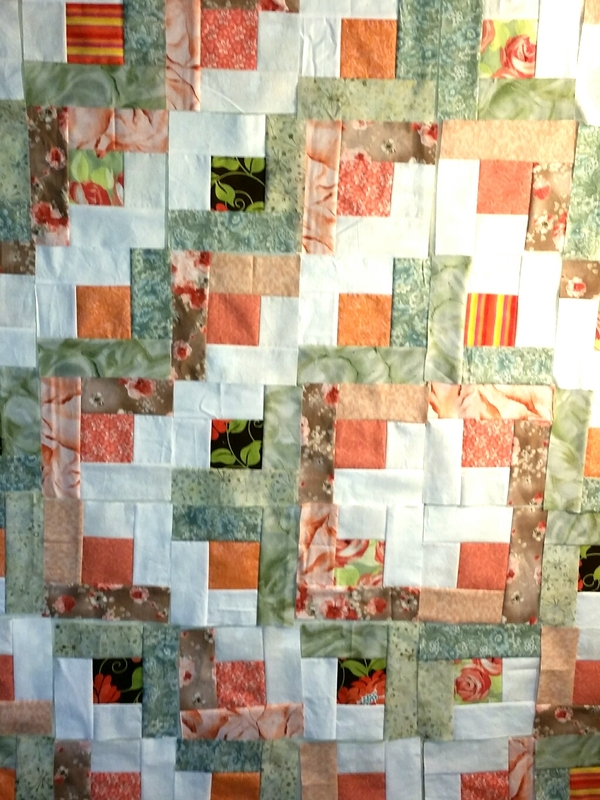 Next time, I will mark centers (at least) on my sashing strips so that everything lines up better. And it’s passed its snuggle test, so I guess all is well! I’m linking up to Whoop Whoop Friday and Finish it up Friday. Categories: Finishes | Tags: charlotte hawks, Evening in the Garden, Scrappy Stars Around the Corner, Valerie Root | Permalink.